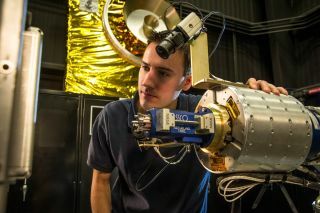 Alex Janas, RROxiTT lead roboticist, stands with the Oxidizer Nozzle Tool, part of a new technology developed to help extend the life of satellites in space. NASA is a step closer to making robotic refueling of in satellites in space after a successful nine-day test on Earth. In the test, operators in Maryland controlled an industrial robot more than 800 miles (1,287 kilometers) away in Florida, successfully transfering propellant into a mock tank. The February trial, known as the Remote Robotic Oxidizer Transfer Test (RROxiTT), tested a suite of new technologies and procedures that could potentially allow satellites to keep operating long after their original warranties expire. "It's one thing to build a set of technologies and discover that they work. It's another thing to consider the capabilities they could unlock," Benjamin Reed, deputy project manager of the Satellite Servicing Capabilities Office (SSCO) at NASA's Goddard Space Flight Center in Maryland, said in a statement. You can see a video of the satellite-refueling test here. "The paradigm of one-and-done should be relegated to the 20th century — the future of space will be re-use, re-purpose, and replenish," he added. Refueling satellites in space is far more difficult than topping up the tanks of cars on the ground. Robots must deal with triple-sealed fuel caps, floating hoses and highly pressurized, corrosive satellite fuel in the weightlessness of space. Further, their operators on the Earth below must rely on cameras to identify challenges, rather than being present on site to observe and troubleshoot unexpected problems. In January 2013, the SSCO's Robotic Refueling Mission (RRM) aboard the International Space Station (ISS) showed that remotely controlled robots could deal with wires and caps on existing spacecraft that were never designed to be refueled. With RROxiTT, roboticists completed a second test on the ground in February 2014, utilizing a highly corrosive oxidizer propellant rather than the safer ethanol that was substituted on the ISS for safety reasons. RROixTT employed new technologies that included a unique propellant transfer system developed by the team at Goddard and collaborating researchers at NASA's Kennedy Space Centerin Florida. The system contains the components that a servicer satellite would require to extend the lifetime of existing orbiting spacecraft, NASA officials said. During the February test, operators at Goddard controlled the industrial-strength robot at Kennedy, mimicking conditions that handlers would experience with an orbiting craft. The test transferred the oxidizer at flight-like pressures and flow rates through the propellant valve and into the mock tank of a satellite. "This is the first time that anyone has tested this type of technology, and we've proven that it works," SSCO associate director Frank Cepollina, a veteran leader of NASA's five manned servicing missions to the Hubble Space Telescope, said in the same statement. "It's ready for the next step to flight." Service robots could help to refuel and repair satellites initially launched without the intent to do either, extending their lifetimes and reducing the money and resources spent. More than 400 satellites circle the planet in geosynchronous Earth orbit, with most beaming weather, communications, and television data to consumers around the world. These single-use satellites were generally sent into space with no contingencies for repair or refueling. By developing the technologies that could enable robots to refuel such satellites and assist them during unexpected emergencies, NASA hopes to add years of functional life to the orbiting fleet, an improvement that could save lots of money, time and effort down the road. In addition, the ability to fix and relocate problematic satellites could help mitigate the growing orbital debris problem that threatens operations in space, researchers said. In April 2012, for instance, contact was lost with the European Space Agency's huge ENVISAT satellite, currently expected to remain in orbit for 150 years. Servicing missions could help remove such dead satellites from orbit far sooner, reducing the chances of dangerous collisions that greatly enlarge the planet's ever-growing cloud of space junk. RROxiTT's tests may also help keep people on the ground safer. The chemical oxidizer that is mixed with satellite fuel to provide the necessary thrust is toxic and highly corrosive, and must be kept at about 20 times atmospheric pressure. The oxidizer — generally nitrogen tetroxide — requires special handling as satellites are fueled prior to launch. Using the new robotic technologies on Earth could allow humans to maintain a safe distance while mechanically filling the tank, NASA officials said. Successful as it was, the February trial was only a stepping stone. The next phase of the Robotic Refueling Mission will take place on the ISSand is currently scheduled to launch in June. Work will also continue on the ground as the team works to command a full-sized robot servicer system to perform a series of tasks on a suspended satellite mockup later this year. "RROxiTT gives NASA, and the satellite community at large, confidence that advanced satellite refueling and maintenance technologies aren't a wild dream of the future," Cepollina said. "They're being built and tested today — and the capabilities they can unlock can become a reality."